This fortnight Patter has given us the word "Priority" for our scripture artwork. 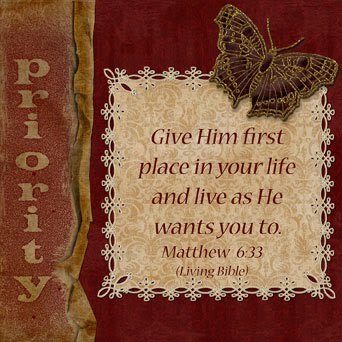 The word "priority" is not found in any version of the Bible so I chose a scripture that tells us what our PRIORITY in life should be. I know that I fail at carrying out this and put other things before God a lot of the time. The Bible tells us that whatever or whoever comes before God in our lives is who/what we worship - an idol. I am determined to put aside the "idols" in my life and worship the true living God. I will strive to put God first - seek first His Kingdom. For my digital art this time I have used a kit called "Remembrance of Time Past" by Nutkin Tailz Designs. I chose to use this kit because of the fact I need to remember to put God first. The sprayed alpha was created using an action by Atomic Cupcake. What a beautiful page Anne-Marie! The scripture is right on. Oooh, I love that scripture and the beautiful colors of this page. So deep and rich. And the butterfly is the perfect touch. Just gorgeous! Thank you for leaving a comment, it is much appreciated. Thankyou for stopping by at my little blog. I do hope my art in some way will inspire, encourage or bring some delight to you. My prayer is that my art will bring glory to the Lord. Arts and crafts have always been a love for me. I have been addicted to rubber stamping for making greeting cards since 1992, now I am also addicted to Scrapbooking which happened in September 2006. Then in February 2008 I discovered digital scrapbooking and hardly ever do any paper scrapbooking now. I also enjoy altered art and if I had the time I would like to paint. I like to use my art to share my love of the Lord Jesus when I am able to.